After the assassination of John F. Kennedy in 1963, Andy Warhol chose photographs used in media accounts before and after the event and cropped them to focus on the president's widow, Jacqueline Kennedy. The artist often employed this unorthodox approach to portraiture, appropriating photographs of celebrities from magazines and newspapers to reinforce an individual's public image rather than creating his own artistic interpretation of a sitter's inner character. Here, the combination of four pictures brilliantly condenses and intensifies the numbing effects of the mass media coverage that shaped the nation's experience of this shared tragedy. After the assassination of John F. Kennedy in 1963, Andy Warhol culled photographs that appeared widely in the media following the tragedy, cropping them to focus on the president’s widow, Jacqueline. The artist often employed this unorthodox approach to portraiture, appropriating photographs of celebrities from magazines and newspapers to reinforce an individual’s public image rather than creating his own artistic interpretation of a subject’s personal character. This combination of four silkscreened photographs intensifies the numbing effects of the mass-media coverage of this nationally experienced tragedy, an impression compounded by Warhol’s use of the same images in multiple works. Erica F. Battle, from Philadelphia Museum of Art: Handbook. Philadelphia: Philadelphia Museum of Art, 2014, p. 357. Warhol began his "Jackie" series shortly after the assassination of John F. Kennedy in Dallas. As the basis for his paintings, he selected eight photographs from the mass-media coverage of the assassination and cropped the pictures to focus on the president's widow. The high contrast of magazine and newspaper photographs served the artist well in his process of enlarging the images and transferring them to canvas via silk screen. 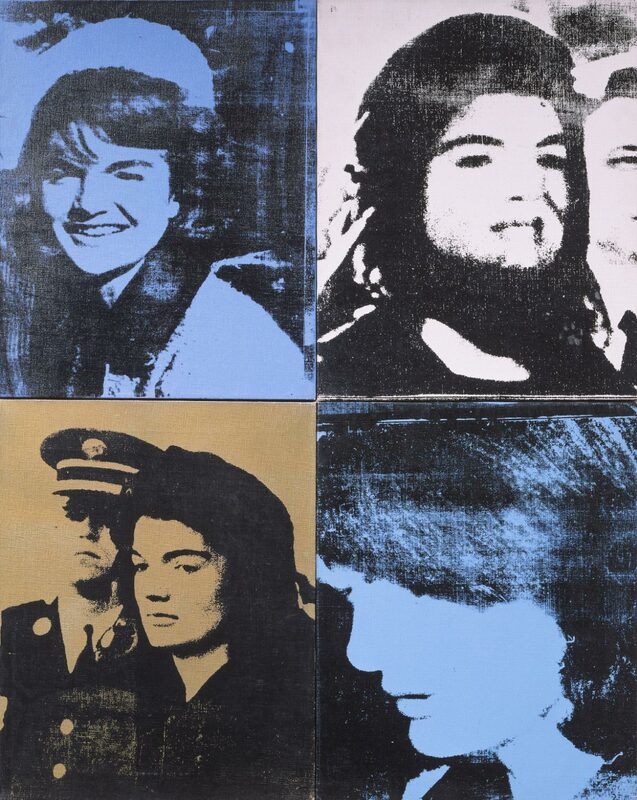 During 1964 Warhol produced an undocumented number of individual paintings of Jackie on canvases 20 by 16 inches, which were sold as single units and in multiple configurations. In this particular group, she is seen in four different "poses" that present a range of expressions and costumes provided by journalists images. The view of Jackie standing with a uniformed soldier by her side, for example, crops and reverses the cover photograph from Life magazine on December 6, 1963. Warhol's disavowals of artistic ingenuity have obscured the extent to which sophisticated formal choices underlay his work. A genuine media addict, he kept vast files of photojournalists' images. But he chose only an infinitesimal fraction of these to make into paintings. His selection of a photo was followed by a calculated decision on cropping; in this painting, the image that includes the half-face of a man behind Jackie reminds us that we are looking at a fragment. The color of the acrylic paint, such as the turquoise of many Jackie panels, also becomes a strongly expressive component of the final composition. Warhol's use of simple repetition is perhaps the most dramatic of all his artistic devices, as it compresses and intensifies the numbing drone of images with which we are confronted over weeks and months of newspaper, magazine, and television coverage. Twentieth Century Painting and Sculpture in the Philadelphia Museum of Art (2000), p. 110.